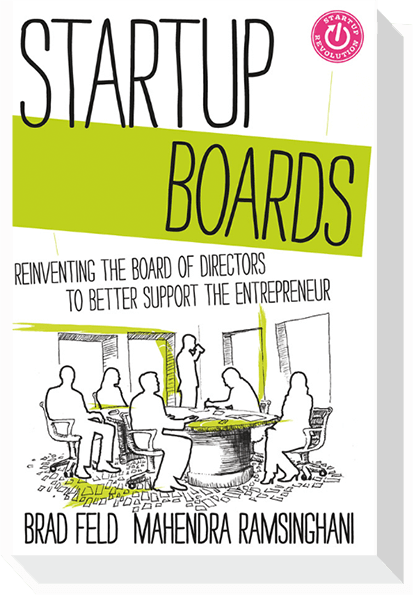 Also included are measures across all 50 US states, the 40 largest metropolitan areas, and along various dimensions of entrepreneur characteristics (race, gender, nativity, education, and age). 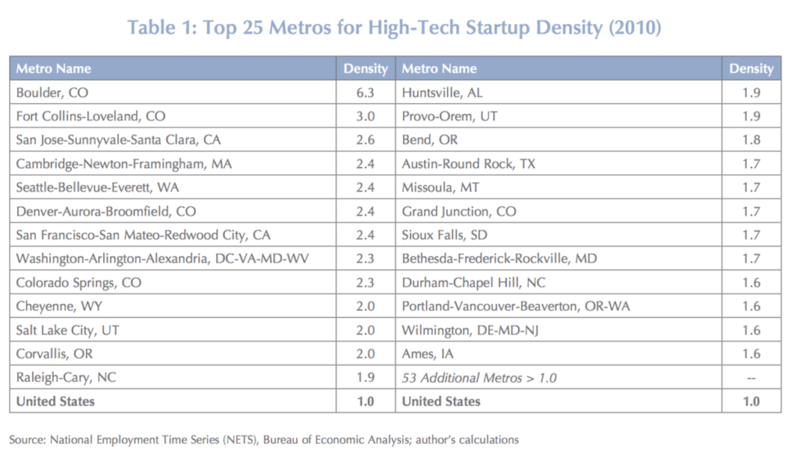 Colorado ranked sixth in terms of “startup density” (new firm formations per capita) and Denver was tenth among the largest metropolitan areas for the same measure. In previous work for the Kauffman Foundation and Engine, I took a look at new firm formation rates specifically in the high-tech sector—where firms are substantially more likely to be growth-oriented and innovation-driven. I examined these trends nationally across the United States and its metropolitan areas. For “density” of entrepreneurship—in this case, the share of tech startups per capita—Colorado is a major outlier. As the two tables below show, for firm formation rates on a per-capita basis for the information technology sector and the high-tech sector more broadly (IT plus biotech, medical tech, aerospace, and engineering services), Colorado cities saturate the top rankings—in fact four of them are in the top 10 for both tables, with Boulder leading the way nationally. These figures are slightly dated, but a subsequent analysis of data from my report showed that density numbers across metros evolve only slowly over time if at all. 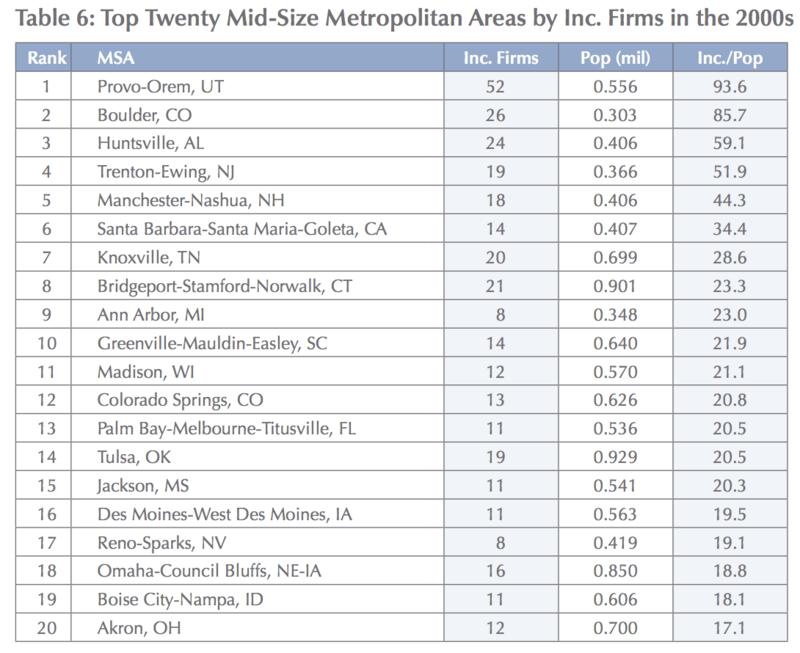 Colorado also stands out in terms of “high-growth” firms. 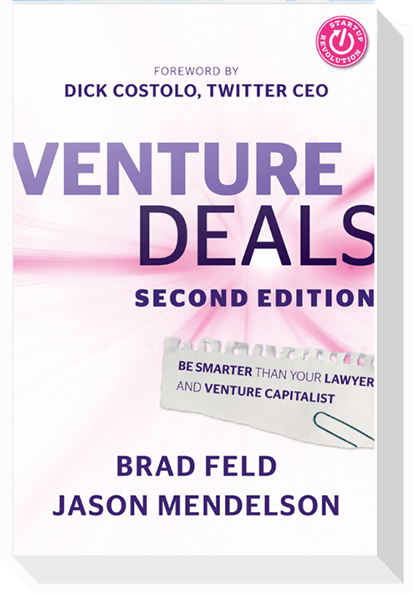 In 2012, researchers at the Kauffman Foundation produced a report that analyzed Inc. 500 data of the fastest growing companies in America. 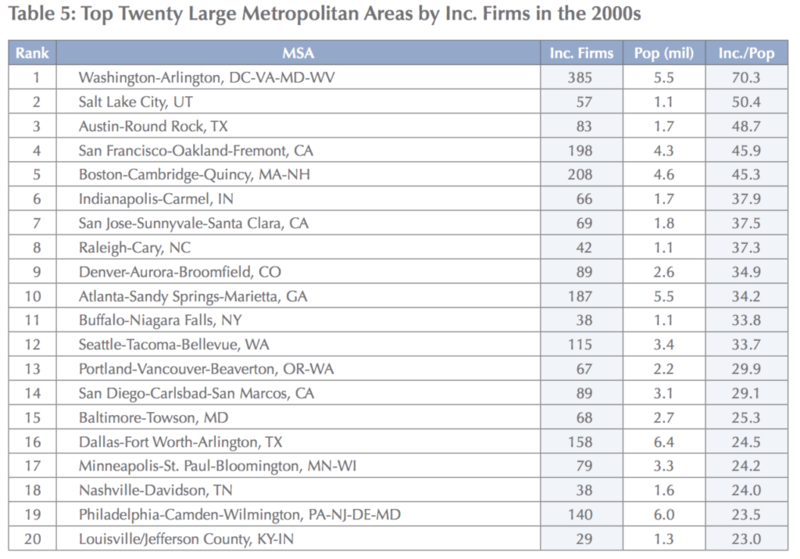 Colorado ranked fifth for highest concentration of high-growth businesses (on a per-capita basis) during the 2000s. Meanwhile, Denver was ninth for large metropolitan areas, and two additional Colorado metros—Boulder and Colorado Springs—ranked in the top 12 for high-growth firm density among medium-sized cities. Density is important for many sectors of the economy because it lowers transaction costs, and improves matching between firms, labor, suppliers, and customers. 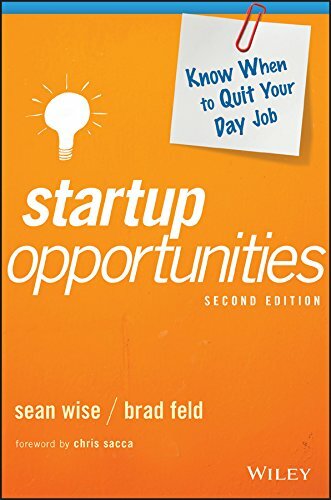 These factors are also beneficial for startups and tech companies, but more importantly, for these innovative, complex endeavors, density generates greater opportunities for knowledge-sharing and serendipitous creation. 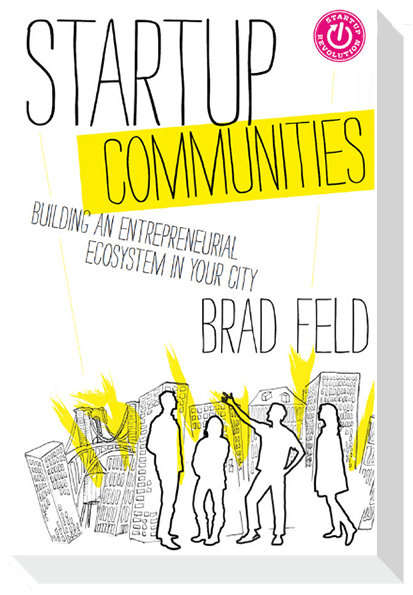 Brad has written about the phenomenon of startup density on his blog (here and here) and about the importance startup of density to entrepreneurial performance in his Startup Communities book. 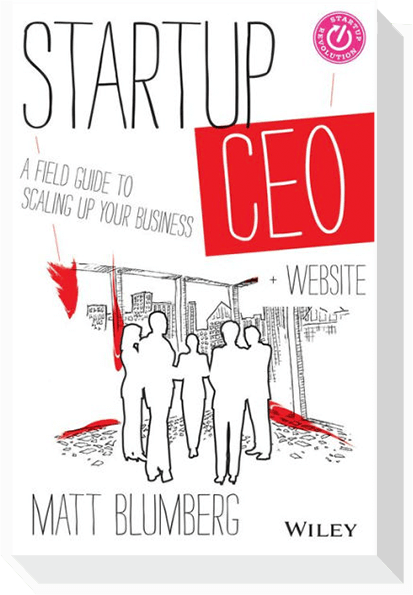 In particular, he notes that when conducting business in well-known startup hubs—like San Francisco and New York—he tends to stay in a relatively confined area. This is especially true in Boulder, where much of the startup activity is concentrated in a very small space (~10 x 4 blocks). 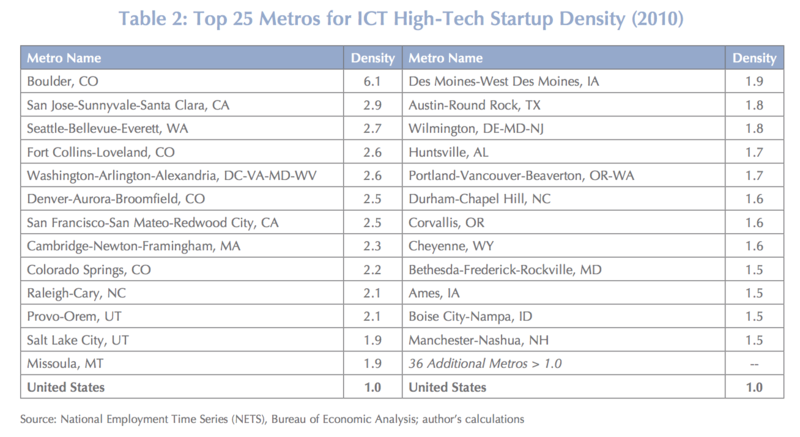 So, measuring startup density at the level of cities or metropolitan areas may be too coarse. Academic research backs this up. Studies have established a high “decay rate” of knowledge sharing over distances. For example, one found that the benefits of knowledge sharing in the software industry are ten times greater when co-locating within one mile versus within two-to-five miles, while another found that the benefits of co-location among advertising agencies in Manhattan was fully depleted after just 750 meters! Visionaries like Steve Jobs knew this, which is why he designed the Pixar office in a way that would maximize serendipitous interaction among colleagues in different departments. And, the importance of density is playing out before our very eyes. Cost of living increases in leading knowledge hubs are stratospheric—yet many entrepreneurs continue to start and scale businesses in these places. Why? Apparently because it’s still worth it. Now, the sustainability of these trends are questionable, and we are starting to see at least some counter-balance taking shape as startups and capital proliferate into more geographic pockets. 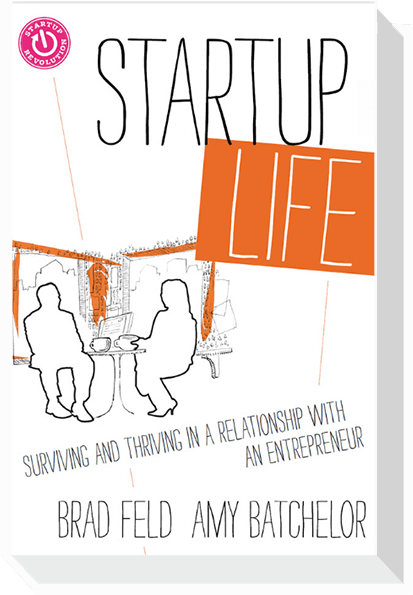 But the fact remains—whether you are in New York or New Haven, San Francisco or Santa Fe, a critical mass of innovators and entrepreneurs co-mingling in a relatively confined area is beneficial to their success.